Number 8 of this Finnish fanzine focused on short stories, poetries music , mail art and comics.I already posted the number 10 and the number 9.It was assembled and distributed by Jupe Luoma in the early 90s.Jupe was also into mail art and running the label Joukkormurha Tapes and the sublabel JM Tapes. 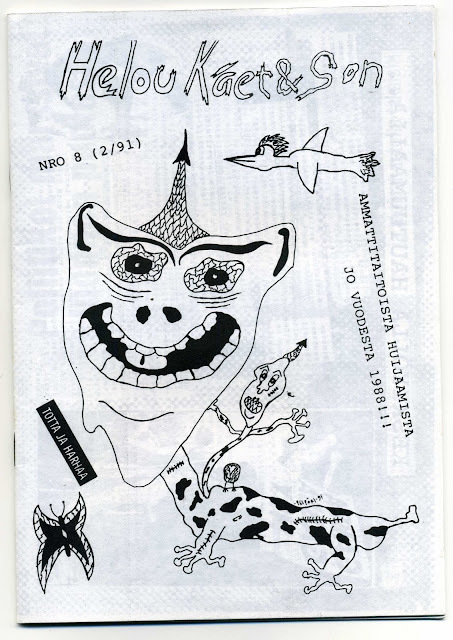 I posted quite few tapes by this Finnish label, you will find them here. This fanzine has few articles, short stories, some poetries, lots of nice graphix works and comics and more random stuff. Few poetries are in English, the most of the articles/comics and other writings are in Finnish. Enjoy it, if you are Finnish literate.